Bootstrapping a cluster from your laptop, or managing machines without needing to first setup a separate config management infrastructure are both very reasonable and fundamental asks. I was particularly inspired by Ansible’s agent-less remote execution model, but never wanted to build a centralized orchestrator. I soon realized that I could have my ice cream and eat it too. To use this mode you run mgmt with the –remote flag. Each use of the –remote argument points to a different remote graph to execute. Eventually this will be integrated with the DSL, but this plumbing is exposed for early adopters to play around with. Each invocation of –remote causes mgmt to remotely connect over SSH to the target hosts. 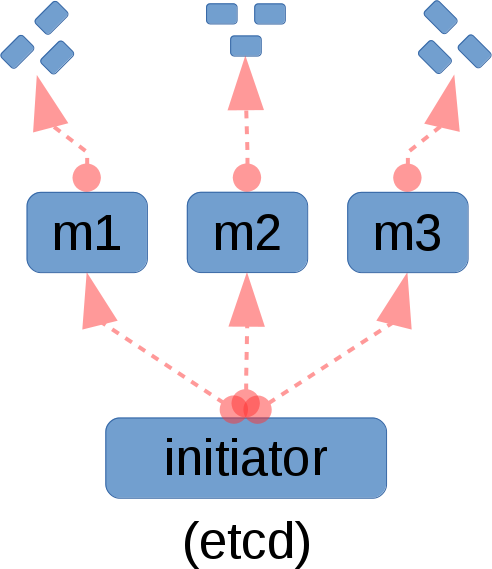 This happens in parallel, and runs up to –cconns simultaneous connections. A temporary directory is made on the remote host, and the mgmt binary and graph are copied across the wire. Since mgmt compiles down to a single statically compiled binary, it simplifies the transfer of the software. The binary is cached remotely to speed up future runs unless you pass the –no-caching option. This second possibility occurs when you run mgmt with the familiar –converged-timeout parameter. It is indeed clever enough to also work in this distributed fashion. You can see the remote execution artifacts, and that there was clearly data exchange. 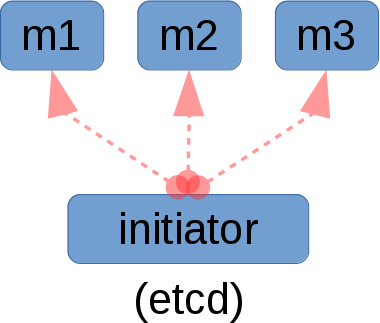 You can repeat this example with –converged-timeout=5 to automatically terminate after five seconds of cluster wide inactivity.